What do you do when you can’t afford broadband and no-cost WiFi is just out of reach? That was the problem Rice University grad student [Ryan Guerra] was tasked with solving. A local Houston resident could barely tap into the free service offered in her area, so [Ryan] set out to extend the signal’s range using white space previously occupied by TV signals. 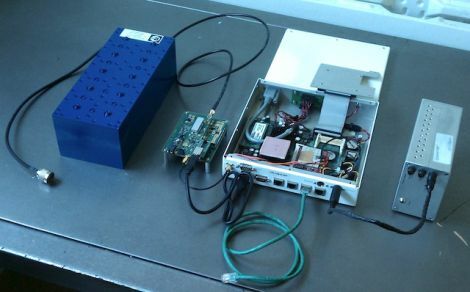 Using channel 29 which operates at 563MHz, his “Super WiFi” project utilizes standard WiFi protocols and can extend the signal’s reach up to a mile. The WiFi signals at the closest tower are piped through a prototype frequency translator, shifting the signal from 2.4GHz down to 563MHz, which is far better suited for long(er)-haul transmissions. The system does not use channel bonding just yet, so it is limited to using about 25% of WiFi’s maximum bandwidth, which is far better than no signal at all. While the widespread practical use of TV white space will take some time to come to fruition, this is definitely a step in the right direction. what about the law? is this legal? I hope he has an FCC license for that or he’s working in Part 15 somehow. Wouldn’t a good directional antenna for WiFi have done the same trick? I remember reading recently that the FCC had opened up some spectrum for public use. Well, I suppose that means that he is using the white space as intended? actually reading the article helps. A set of old Dish network dishes and bi-quad antennas as feedhorns will do the last mile very nice. I have been able to “burn” through wet trees for a 1/4 mile link with that kind of set up using 802.11b speeds. Far easier to do. prototype frequency translator? what’s prototype about a step-down superheterodyne? the fact that it retransmits the IF? yeah I read the article, my point is that the basic technology for this is about 80 years old, unless I’m mistaken about the technique being used here. not that this isn’t a good idea, but saying prototype makes it sound like brand new technology. Or it’s like rebranding windmills “wind turbines” to give theme some kind of 20th century twist, because, at the end, the energy generated will be use somewhere to mill. So Middle Ages. I think Ronja uses normal LEDs instead of lasers. And iirc it pushes ethernet directly to air, which may or may not be such a great idea. There will be a large explosion in devices using this “white space” in the near future. According to the new FCC rules, there are three classes of such devices. This particular application uses “fixed location” devices. Such devices need to have their GPS coordinates entered into a central database. In one way or another, all such devices have to interrogate a central database to assure non-interference with licensed users. Google is one of the three approved database administrators for this spectrum. Taking into account what you can actually build without complex optics, ronja’s scheme (baseband ethernet + training signal in inter-packet gaps) works as well as anything other, adding some kind of FEC might slightly help but also bring significant amount of additional complexity (which in hobbyist terms probably involves high-end FPGA). I don’t suppose there are any actual schematics and software listing so that we may build something similar? I like the thought of using the white spaces for stuff like this, and envy these folks for their freedom to experiment and their ability to bring us projects like this. Doesn’t it interfere with the UHF transmissions ? UHF is no longer used in the USA for television broadcasts. It was phased out several years ago. Having lived “out in the woods” with crappy, expensive ADSL for a while, I’m totally psyched for this. It lends itself to natural monopolies because hey, limited spectrum, so I can see towns jumping on this. A a wifi amp and a good antenna will beat this setup at FULL 802.11 speeds. Waste of time. Is the hardware the same on both ends? I hate to be that guy, but if all you want is to run wireless Ethernet at a lower frequency, you can buy off-the-shelf 900MHz gear that will do a much better job (ie. full performance) with very little effort. What he’s done here isn’t novel or impressive.